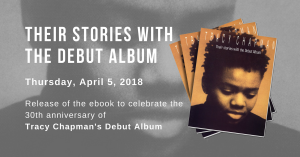 Tracy Chapman tells stories her own way – By Sarah Rodman, © Boston Herald and Herald Interactive Advertising Systems, Inc.
Friday, August 4, 2000 – Tracy Chapman, Jeffrey Gaines, FleetBoston Pavilion, Boston, last night. Tracy Chapman’s latest album is called “Telling Stories,” but last night at the FleetBoston Pavilion the folk rocker didn’t want to tell a particular tale. “I’m sure you’ve all probably heard this a million times,” she groaned. But the sweetly appreciative capacity crowd had their way. The Tufts grad was trying to explain how her unity lament “If Not Now . . .” was associated with Boston even though it was written in Argentina. (She used to play in Harvard Square and an avid fan wanted to, and did, fly her to Buenos Aires to play for her family.) Chapman, chatty and gracious all night, joked that it all could’ve gone differently if that fan had made good on the promise to secure her an Argentinian record deal. “You all might never have heard of me unless you were a fan of obscure world music,” she said with a laugh. Thankfully, Chapman decided to make her records, and tell her stories in this country. Last night’s warmly embracing hour and 45-minute performance focused mainly on “Telling Stories” and Chapman’s critically acclaimed 1988 debut and their collective songs of social protest and personal politicking. While decidedly low-key overall, the show ebbed and flowed with great dynamism. The gentle entreaty of “Baby, Can I Hold You,” segued smoothly into the more uptempo “Wedding Song,” which found guitarist Doug Pettibone and violinist Alison Cornell adding gauzy harmonies to Chapman’s stealthy vocal. Drummer Denny Fongheiser tapped out a martial tempo on the folk noir of “For My Lover,” which was enhanced by the contrasting textures of mournful pedal steel, scratchy hurdy-gurdy and eerie fiddle lines. “Fast Car” was, ironically enough, slowed down just a touch and a melancholic fiddle solo captured the song’s still riveting and somewhat depressing tale of the stages of urban hopefulness, the smack of reality and the yearning for the illusion of escape that a fast car gives. Jeffrey Gaines opened the show with impassioned tales of love and betrayal in his throaty, Elvis Costello-like voice.